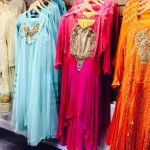 Zahra Ahmad UK has been officially launched on 1st of October 2014 in Manchester. 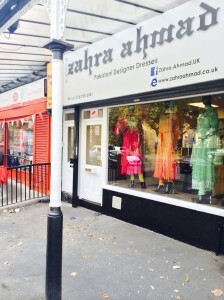 This is the first official international outlet of Zahra Ahmad and its in Manchester, United Kingdom. 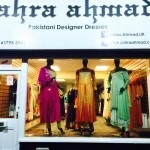 Zahra Ahmad UK is located at 75 Middleton Road, Manchester, M8 4JY. Phone number of Zahra Ahmad UK is 0161 795 3941. Because this is an official outlet, there are certain benefits of going to this outlet. First one being that they have full casual and formal range of Zahra Ahmad. 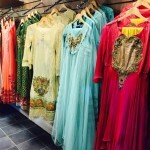 The second benefit is that because its an official Zahra Ahmad outlet, the prices are very decent. And the third one is that when you buy directly from the Zahra Ahmad outlet you know that you are buying the original designer dress of Zahra Ahmad. 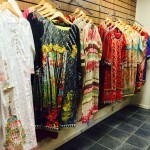 Because Zahra Ahmad UK is an international outlet, it benefits from its own Facebook Page https://www.facebook.com/Zahra.Ahmad.UK and its own website www.zahraahmad.co.uk with UK pricing, UK stock and UK delivery charges. 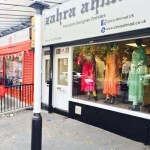 When we visited Zahra Ahmad UK, they had a lot of formal dresses from Zahra Ahmad’s Golden Age Collection and casual dresses from Autumn 2014 collection. While the casual dresses of Zahra Ahmad UK had a sharp taste of colour in them, their formal dresses were more subtle and elegant. There was plenty of free parking available on the road and as they are located on 75 Middleton Road, they were very easy to find. We were only able to find very limited photos of the outlet which we are adding here. If we manage to get some more pictures, we will add them as well.